True, TF1 and France 2 might have devoted the majority of their evening newscasts the past two evenings to the passing of national icons, singer Michel Delpech and actor/comedian Michel Galabru, respectively - no, not a good year so far for les Monsieurs Michel - you wonder how they could have missed the bombshell, reported in Le Parisien, that le doggy bag has come to French restaurants. Oui indeed - as of January 1, 2016 all customers engaging in the ultimate faux pas of leaving part of their ordered meal on their plates can now take home the remains in a doggy bag. However, there is a caveat: according to the Union of crafts and hospitality industries (Umih), this development only applies to restaurants serving between 150 and 200 people a day. That pretty much eliminates about 95% of the restaurants reviewed on this site, but then again, if you are eating at the restaurants I review, you're not going to leave much on your plates, its just too damn good. measure has grander aspirations. It is an element of the 2011 law on bio-waste - the waste associated with food preparation, the remnants of food served, and food that passes its expiration date - which is projected to reduce food waste by 50% within the next ten years. This reminds me Intermarché's well-known 'Inglorious Fruits and Vegetables' ( 'Fruits & légumes moches'), launched in 2014, which also was developed in the spirit of the bio-waste law. 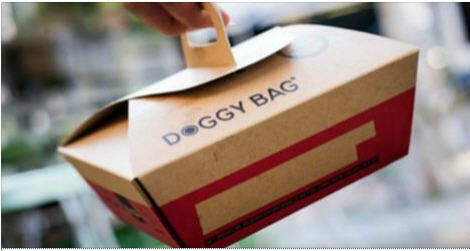 We'll have to see how far we get with le doggy bag measure. I remember reading a few years ago about French restaurants providing the option for a wine doggy bag, but have seen nary a one. That may have to do more with the fact that I never stick around to see people not finishing their wine - the very thought sends shivers down my spine. 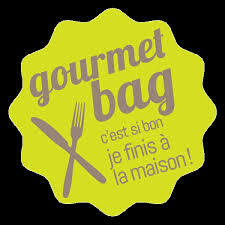 According to le Parisian, the Anglo-Saxon practice of providing patrons with doggy bags connotes a stinginess that is not to be confused with French dining propriety; as a result, the Management of Food, Agriculture and Forestry in the Rhône-Alpes has chosen to call the food transporter a "Gourmet Bag", and prompting the slogan “C’est si bon, je finis à la maison!” ("It's so good, I finish it at home!"). 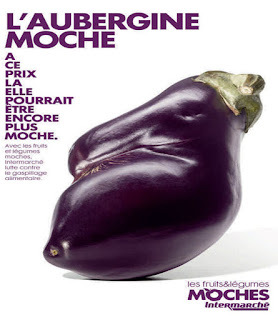 N'importe quoi.